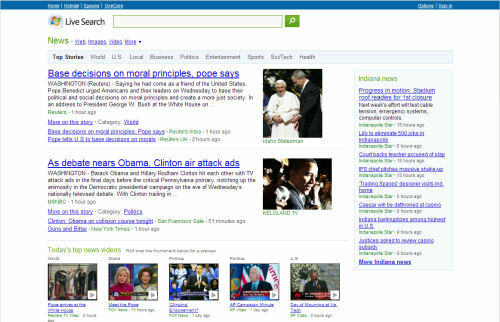 Looking to take on Google News, the Redmond company on Tuesday silently launched its own news aggregator. While Live Search News looks much more basic than what Google currently offers, it's a start. The layout of the new Live Search News is somewhat similar to Google News, but also may remind some of Techmeme, another aggregator. Sections are listed across the top, with news headlines listed down the left column. Users are able to drill down from the major headlines by clicking "more on this story," which returns news articles having to do with the topic of the headline article. That column is split by a section listing the top news videos, and a right sidebar lists local news headlines, which seem to be derived from the user's IP address, which usually provides clues as to location. A quick scan of the sources seems to list only the major news outlets, which contrasts from the all-encompassing Google News, which adds in stories from smaller sources as well as prominent blogs. During breaking news events, an orange bar appears at the top of the page, listing the headline. Microsoft watchers have noted that these headlines at this time only appear to be coming from MSNBC.com, which the company co-owns with NBC Universal. While Live Search News may never be able to break into Google's dominance in the news aggregator segment, having another player in the space will benefit publishers. Anecdotal evidence suggests that these services may actually do a better job of driving traffic to news sites than the front pages of these sources themselves. While in some cases these companies have taken issue with their content being indexed, for the most part they have been well received. Exact details on Microsoft's future plans for Live Search News are not yet known, as no official announcement of the service had been made as of midday Wednesday.